Please find the presentation itself on slideshare.net/helgetenno. 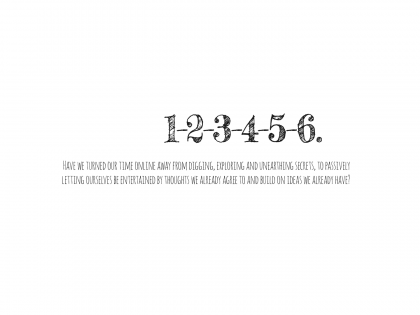 The following text is the manuscript for my talk at the TEDx event in Umeå, Sweden, in January 2013. 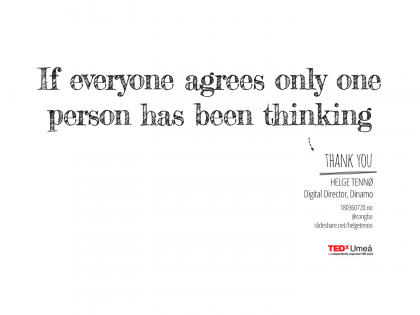 I’ve added the the slides and the TED-videos I reference in the talk. 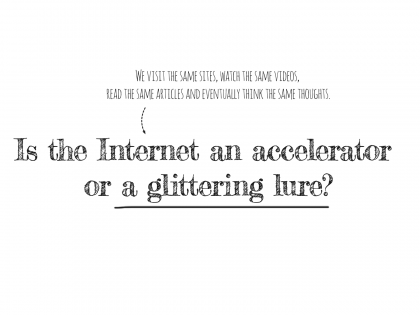 I love the Internet, but I think the best thing about it is our opportunity to question and shape how we use it. In 2011 Eli Pariser, at TED, talked about the online filter bubble, in which the technology – in its agency to create a better and more relevant Internet – ends up filtering out a lot of the stuff that would normally be visible to us. Pariser raises awareness on this topic; that we should be aware of how technology potentially is filtering our perspective on the world. Now, my point is that we should apply the same cautiousness to our own creative habits. Because we are also masters at creating our own self-inflicted filter bubbles. Affecting how we think, and potentially our ability to have original ideas. There is one important point to be made here; that we need to look at the Internet when it comes to creativity as two different things. One of them is in regard to creative output, which it is marvelous at. But the other concerns our creative input – how we use technology to feed our creative processes. 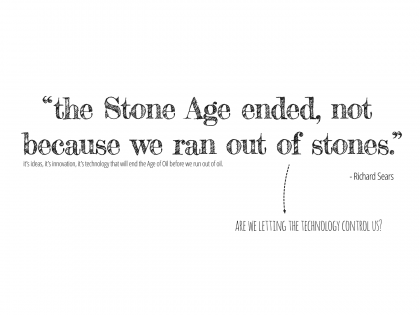 We tend to just plug in technology, without thinking of the consequences or working enough with adapting our habits. If you look at our educational system it is largely built on the same concept as when it was invented a long time ago. Then suddenly, we just plugged in digital communications technology and students went streaming into the classrooms and lecture halls with laptops and Internet connections, consuming knowledge in a completely new way. But the way we teach stayed the same. The same goes for the creative processes; they are built on the same premise as they have been for decades, and we haven’t thought enough about what happens when we plug this connected technology into them. There are some new social concepts for collective innovation and sharing, and some of them are really fascinating, but they are also the most interesting things we see. When you look at it, the Internet seems to be very good at creative output, but at the same time tends to blind us from the six pitfalls that exist when it comes to our creative input (I’ve brought six, there might be others). In her quote, “if we share only what we like, what happens to the stuff we don’t like?” Danah Boyd asks; what didn’t I see, and does this filtering affect my perspective and thinking? In general, is creativity and originality better of if we enjoy more of the stuff we are already familiar with and agree to? Or is our creative process loosing out as we expose ourselves to fewer disagreements and opposite views? Some years ago Microsoft released a survey suggesting that even if the Internet is full websites and resources, we tend to stick with what Microsoft called “our neighborhood” of sites: A small collection of websites that we visit regularly, and that we seldom look elsewhere. Having a limited set of resources we regularly use isn’t special for the Internet, but the Internet potentially accelerates and polarizes all of this. And when it comes to creative processes we need to discuss if there are weaknesses in our habits. 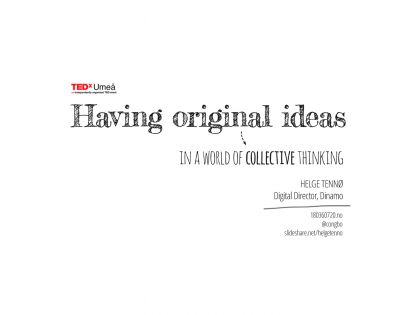 In his TED talk Kirby Ferguson discusses how human creativity is essentially a remix culture, and he makes the suggestion that how we create is through collecting, copying and recombining other peoples work and producing our own version of it. But there was a different generation, one that we didn’t see and didn’t talk that much about. This is also a Generation C, a generation curation. 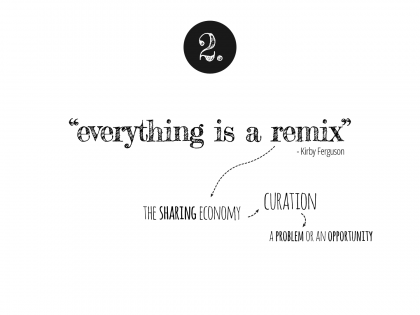 In the context of Kirby Ferguson, who says that all creativity is a recombination and reproduction of other people’s ideas, the curation generation doesn’t really produce anything, they publish. It is a generation of publishers posting other peoples productions in new contexts and new combinations. Now, the generation curation is excellent when it comes to creative output. It is not up to us to define what creative expression is. At the same time, technology is nothing if not a toolkit of new opportunities for people to invent new languages and new instruments for their creativity. But when it comes to the creative input, it is easy to question what these new personal publishing outlets offer to the world. Because even if sources like Pinterest give us the ability to scour thousands of brilliant productions each day it only presents them as bland objects. There is no depth, no insight, no reason for thinking, no reflection. I have had several discussions with senior creative craftspeople who find that even if these sources dig up a lot of good stuff, they are just entertainment. 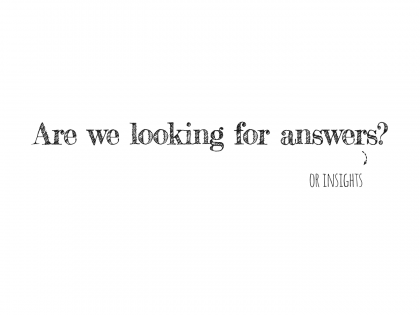 Because they only scratch the surface and don’t offer what is important to the creative process – thinking. Now I agree that this is presenting it very black and white, but I have myself been caught up in these resources could waste hours at end without having anything left but numbness. The generation curation could be brilliant for the creative output, but it raises a lot of questions when it comes to the input. In 2011 I listened to a talk on art and inspiration by British artist Lizzie Finn, and I got the chance to ask her some questions afterwards. Now her talk concentrated a lot on how she found her inspiration, which was almost exclusively in the off-line environment around her – so I asked her about all the inspiration and ideas she could find on the Internet. She answered by talking about the Internet as two different things. When it came to creative output she found it very valuable. Several people had picked up some of her stuff and posted it on their blogs and on forums; this again led to good marketing and increased attention from galleries and buyers. But when it came to creative input, she saw a whole different thing. Her answer was as quick as it was brilliant – she said: the problem with the internet – even if it’s filled with brilliant stuff – is that everyone else is there – if you find something brilliant that inspires you – millions of people will have found the same thing, and potentially have the same inspiration and the same ideas. 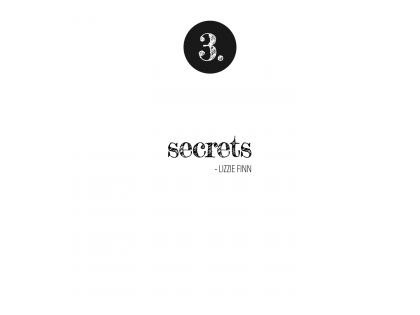 Finn said what you need to look for are secrets – secrets - the stuff that is all around us but that no one else sees or is looking for. Now in my words this helps me to slightly redefine one of the old definitions on creativity. From Finding answers in places where there are none to finding places where there are no-one. 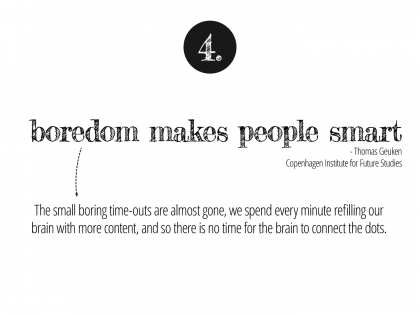 Thomas Geuken, at the Copenhagen Institute of Future Studies suggests that the time-outs we have during the day are really important to our creative capacity. Because, even if we feel bored and that nothing is happening, the brain does not stop working. It is in these small breaks where nothing happens that the brain starts breaking apart, organizing and connecting the information we have collected through the day with our old memories. It’s in these processes the brain discovers new connections and offers us brand new and interesting ideas. Anyone who has been standing in the shower or sleeping and suddenly had this brilliant revelation probably knows what I’m talking about. Now the problem is that these small time-outs are disappearing. Because what we do today when we have some time off is that we pick up our phone or open our laptop and we scour for entertainment and new information. If these small breaks disappear there won’t be time for the brain to make connections and small discoveries alt through the day – and if I understand Geuken correctly he thinks that this high paced information rich environment, where we don’t allow ourselves to get bored – is actually working counter productive to what we are trying to achieve – a more effective and efficient day or creative work environment. 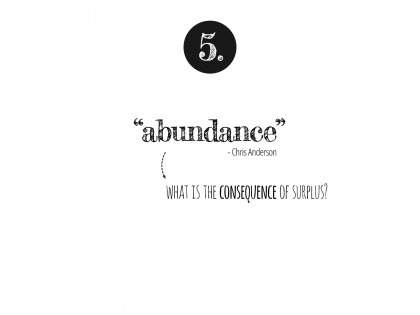 Chris Anderson presents surplus and abundance as something valuable that has been given to us by the internet. - At a time where space is essentially free publishers can be far less picky when it comes to publishing content, everything can potentially be available. Anderson presents the first line of effect, that more content gets published, more long tail content, something for everyone. Its obvious what happens to the publications and their creative output, but what happens to the readers? In a world of scarcity interesting content is hard to come by, so we try harder. In an age of surplus there isn’t just one or to alternative reads, there are hundreds or thousands, and they all scream for attention and they all promise something valuable. Several times I have tried to quit the online, fast-paced inspiration carousel, and moved to slower stuff like books or magazines. And I find it wonderful when the brain wanders of mid-sentence, or where a pen is able to make notes in the margin of a magazine or article. And slow technologies almost always give me (personally) much more, instantly, compared to when I consume stuff in the online world. My question is if abundance also has a negative side – when it comes to the input of information. Has abundance forced us to consume more? And are we compressing our activities into smaller and smaller chunks in order to get through more? - It used to be that an 14 minute TED talk was short and compressed information, now this rather is a 90 second video on Vimeo. One of the benefits of technology has been efficiency and speed – but instead of settling for the efficiency of technology we seem to want to copy this efficiency in our own biology, we are almost forcing the brain to do several tasks simultaneously – which it is rather poor at doing. A lot of research now seems to agree that your brain does not multitask, and trying to slows you down and corrupts your concentration – resulting in us understanding less and remembering less. The brain switches focus, concentrating on one task at a time – and jumps from task to task as our attention shifts. 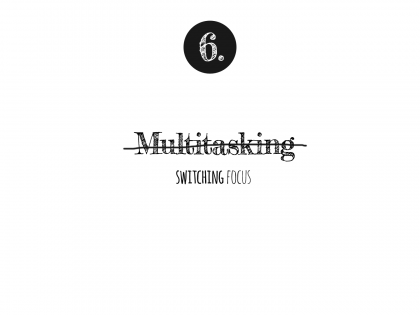 It seems that the whole idea of multitasking our way into more efficient creative processes brings about abilities that run counter to creativity and originality, and that we should allow for some processes to be slow and others quick. My question is if we to blindly are letting technology lead us? Do we think of this as the age of the Internet just because we have the Internet? Do we think of the Internet as a brilliant place for information and inspiration just because it is filled with information and inspiration? Or are we questioning it, how it affects our creative habits and our thinking? I think we have to look at the difference between creative output and creative input, and see that even if the Internet Is very good at outputting and publishing creative work, there are still a lot of pitfalls when it comes to using the Internet for creative input. Our creative habits will probably never finish developing and changing, or be as good as they can be. So, in the name of progress and creativity we have to continue questioning our processes, even the creative ones. Online we have been amazed at the amounts of valuable resources that are immediately available to us. But how do we work with such surplus, and how do we use the Internet so that it becomes insight and new ideas, not just answers and entertainment?